Wilma was born in Washington, D.C. to Swiss parents. When she was 10 to 13 years old, she lived with her family in West Africa. As a young adult, she studied illustration at Rhode Island School of Design and received a BFA in graphic design from California College of the Arts. After working as a freelance print designer for two decades, Wilma began creating abstract sculptures in concrete and mosaic in 2007. She developed her methods through a combination of self-teaching, experimentation, and classes. Wilma's work has been shown in over 50 shows nationally, and won several awards. She has participated in a dozen open studio events. 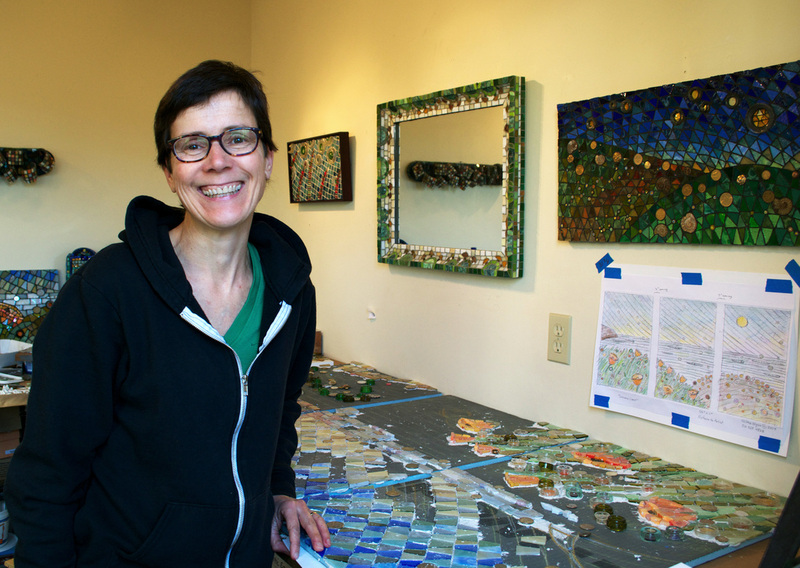 Wilma teaches mosaic art at Esalen Institute in Big Sur, CA, as well as Studio 9 in Oakland. ​Site-specific mosaic artwork has been commissioned for Kaiser Hospital in Oakland, CA, as well as Esalen Institute, in Big Sur, CA. In the summer of 2016, Wilma completed an outdoor sculpture commissioned by the Grinnell Arts Council, in Grinnell, Iowa, which was funded by the Iowa Arts Council and the National Endowment for the Arts. She has created and installed mosaics in bathrooms, kitchen and outdoor spaces in Bay Area private residences. In 2018, Wilma was awarded a 300 square foot outdoor mosaic for Marin County Parks. Currently she's fabricating the project in her studio and will install it in June 2019.